Dropshipping is a business model in which the e-commerce store owner doesn’t buy the products from the manufacturer beforehand but instead only acts as sort of intermediary that delivers the order made through his store to the manufacturer and the manufacturer then ships the product directly to the customers. However, if you are planning to do dropshipping, you can’t just list any products from any manufacturer to your store and then expect them to the ship the products to the customers. Instead you will have to before hand establish a business relationship with the manufacturer and get an OK from them for listing the products on your store. As you might imagine establishing these relationships could be quite time consuming and also quite difficult. Luckily though these days there is a very easy way to setup these relationships. You can do it extremely quickly by opening an account at Shopify and then connecting your Shopify account to a service called Oberlo. Oberlo is a service which has established a relationship with ton of different manufacturers and as soon as you open your account at Oberlo, you can start listing products from these manufacturers to your online store (as mentioned, assuming that it was built using Shopify). So, you might be wondering how you make profit when you are operating using the dropshipping-model. It is really quite simple: when you open Oberlo you can see the prices for every product, but instead of having to list the products using these prices to your own store, you can choose any price you want. So let’s say that some necklace costs $3 on Oberlo, but you decide to list it for the price of $9.90 in your store, in this case would make $6.9 when you sell the product ($9.90 - $3 = $6.90). However, it is important to note that in addition to the actual prices listed on Oberlo, the manufacturers also charge shipping costs on every product that they ship to a customer. The good thing is, that you can easily see these shipping costs from your Oberlo account – and then you just have to make sure that you cover the shipping cost someway on your store (either through a higher price on the product or having a listed shipping cost in your own store). Oberlo is free-to-use if there are at most 50 orders through your store in a month, if there are at most 500 orders in a month the price is $29.90/month and if there are more orders than that, the price is $79.90/month. As you can see, you should be able to easily cover the rising cost of the Oberlo plan by making more money thanks to the increased number of orders. In the case of Shopify, the cheapest monthly plan (when running a store, dropshipping or not) is $29, however it is possible to get a discount if you are willing to commit to Shopify for at least a year. At the moment Oberlo only works with Shopify, but luckily Shopify is a relatively cheap ecommerce platform. So now that we have covered the basics of dropshipping and how to get started in doing it, let’s look into the pros and cons of doing dropshipping, when compared to the traditional model of doing e-commerce – buying the products to yourself beforehand, only then selling them and taking care of shipping etc. As explained above, you can start doing droshipping for just $29 (/month), compared to the traditional mode of doing e-commerce, this is extremely cheap. If you were to buy products beforehand for your store, the initial investment could very easily run into the thousands or even tens of thousands of dollars. In addition to dropshipping being a very cheap way of starting to do e-commerce, is also very quick way to start doing it. In my personal experience, you can easily start selling dropshipped products through your store the same night that you start creating your store with Shopify. Because you don’t have to store any of the products that you have listed in your store, you can very easily and quickly test all kinds of products and also chase trends (i.e. if you see some silly toy, like fidget spinner, being trendy you can start selling it very quickly and without a major financial risk) . Of course, for the sake of this, it is a good idea to a pick a domain name for your store that is not too specific to any single product or product category. Depending on the products you decide to sell, storing them can be quite expensive and it can also require lot of unnecessary work. Shipping the products yourself can be surprisingly time consuming and any time spent on that would be away from actually making your e-commerce business grow. This is obviously kind of a negative pro, but nevertheless it is something to keep in mind, when choosing between doing dropshipping or using the traditional method of doing e-commerce. If you are a traditional e-commerce store, shutting it down quickly can cause significant financial losses, as you will likely have to get rid of the products with a significant discount. Naturally with dropshipping you don’t have to worry about this, as you can simply remove the products from your store and be done with it. Because you can’t see the products before they are shipped to the customer, there is an increased risk that they don’t match what the customer though he or she was getting. However, one way to reduce this risk is to do a test runs and occasionally order products to yourself, to see that they are what they should be. The issue with quality control can be especially crucial these days, as people are eager to share their bad experiences on social media. Is it not at all uncommon that delivering the product from the manufacturer to the customer can take up to 3 weeks, and during the Chinese New Year (vast majority of the products are shipped from China) the shipping times can be even longer than usual. The fact of a matter is, that many people are not willing to wait this long, when they can get almost the same product from Amazon much quicker. Because IT IS so cheap and easy to get started with dropshipping, there is also the risk of the profit margins becoming very low because of the intense price wars between the sellers. One way to escape the price wars is to try to sell products that other sellers are not selling. Let’s say, for example, that the product that was shipped to the customer had broken during the shipping process and the customer asks for a new product in order to replace the broken one, in this situation it would be nice to just send the new product to the customer quickly and ensure that he or she remains relatively satisfied, but because you are operating using the dropshipping model, getting the new product to the customer can take several weeks – and this obviously is not something that will make the customer very happy. At least in the case of Oberlo, it is not currently possible to sell any products from the likes of Nike and Apple, so if you want to operate in an industry, where people are looking to buy “brand products”, dropshipping is unlikely to be the best option for your e-commerce store. Still interested in doing dropshipping? 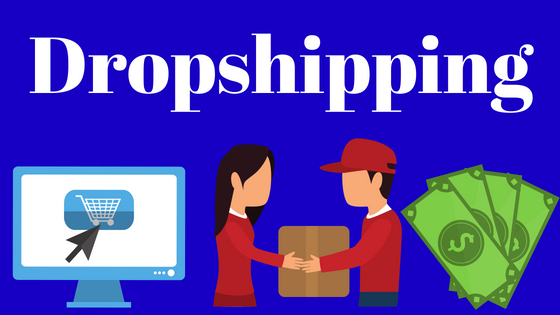 Now that you have seen the pros and cons of dropshipping, you probably have a decent idea, if it is right fit for you. If it is, open your Shopify account now.